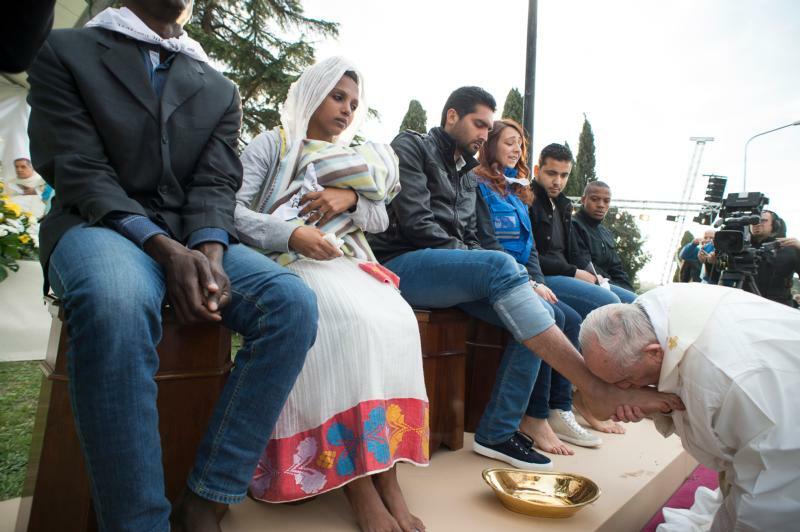 ROME (CNS) — In a moving gesture of brotherhood and peace, Pope Francis washed the feet of several refugees, including Muslims, Hindus and Copts. Gestures, like Jesus washing the feet of his disciples, “speak louder than words,” he said during the Holy Thursday Mass of the Lord’s Supper March 24. Coming together, he added, is another gesture meant to show a desire to live in peace as brothers and sisters despite people’s different cultural and religious backgrounds. 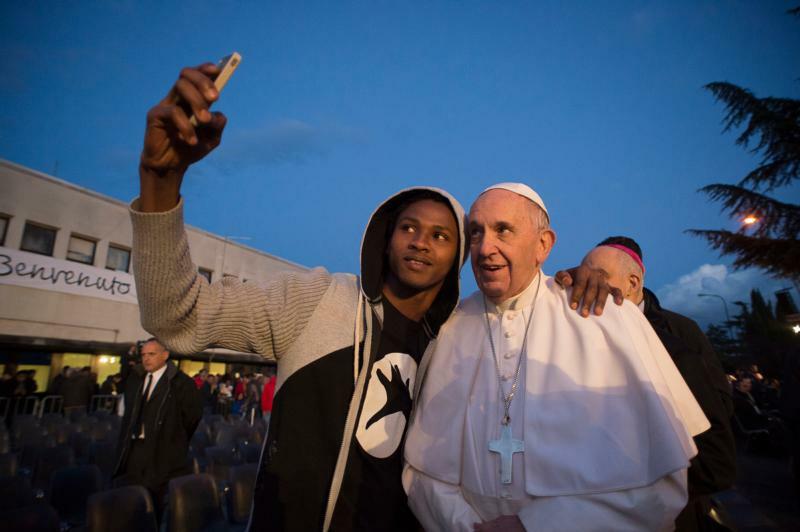 Hundreds of refugees were outside hoping to catch a glimpse of the pope as he made his way into the courtyard of the Center for Asylum Seekers at Castelnuovo di Porto, about 15 miles north of Rome. Prior to his arrival, the pope sent some Easter presents for the center’s guests: 200 chocolate Easter eggs, a wooden chess board, and several autographed soccer balls and baseballs. After getting out of a blue four-door vehicle, the pope was greeted by Archbishop Rino Fisichella, the main organizer of the Vatican’s Year of Mercy initiatives, as well as the directors of the refugee center. He was also introduced to three residents who would serve as his interpreters: Ibrahim from Afghanistan, Boro from Mali and Segen from Eritrea. One of the refugees handed the pope a marker, which the pontiff used to sign a banner depicting the flags of 26 nations, representing the countries of origin of the center’s guests. In his brief, off-the-cuff homily, the pope said there were two distinct gestures in the day’s Gospel: Jesus serving and washing the feet of his disciples and Judas receiving money by Jesus’ enemies to betray him. “Today as well, there are two gestures. All of us here, (coming) together — Muslims, Hindus, Catholics, Copts, Evangelicals — but (being) brothers, sons of the same God who want to live in peace,” he said. “In this moment, when I do Jesus’ same gesture — to wash the feet of you 12 — all of us are making this gesture of brotherhood. And all of us can say: We are diverse, we are different, we have different religions and cultures, but we are brothers and we want to live in peace,” he said. After his homily, the pope removed his vestments and put on a large white garment tied over his alb. He kneeled before each of the 12 people, washed each person’s foot slowly and dried it. The refugees barely contained their emotions, tears streaming down their faces as the pope bent low and kissed their feet. A young mother wiped her tears as the pope gazed at her and reached out to touch her baby. The evening Mass was the second of two Holy Thursday liturgies for Pope Francis; the first was a morning chrism Mass in St. Peter’s Basilica. Before going around and greeting each of the center’s residents individually, Pope Francis asked them to remember the beauty of living together as brothers and sisters despite their different cultures, religions and traditions.